I’ve never been one for romantic comedies. I always thought they were too cheesy, highly predictable, and downright unrealistic. The typical story of ‘girl meets boy’ did little to hold my attention, and it was a rarity that I actually finished watching a Nicholas Sparks inspired film (I haven’t even seen The Notebook). It’s not that I don’t enjoy romance, and I promise I’m not a cynic. I’m quite the hopeless romantic actually; I’m all for flowers and stuffed animals and star gazing and sweet gestures. My problem with romantic comedies when I was growing up was that I could never identify with them. Being gay does that. It’s hard to become emotionally invested in something when it doesn’t resonate with you on a personal level. Watch the 'Love, Simon' trailer here! I couldn’t tell you how many rom-coms I sat through during all the sleepovers I went to growing up. I also couldn’t tell you which ones we watched; they still all blur together. There wasn’t one movie I found myself thinking about days, weeks, or months after watching it. That is, until I watched Love, Simon. I cried while I was watching it, but not because it was sad. I cried because I finally saw part of myself on screen, and I didn’t think I ever would. The movie is based on Becky Albertalli’s novel Simon vs. the Homo Sapiens Agenda, and it’s an honest depiction of what it’s like to come to terms with yourself in world that isn’t always so accepting. Simon is a senior at Creekwood High School, and he has a self-proclaimed ‘totally normal life.’ He actually likes his sister, has a good relationship with his parents, and a solid group of friends. However, no one knows he’s gay. When a post is submitted to his high school’s confession blog by another closeted gay kid, under the pseudonym Blue, his world quickly changes. He finds the courage to email Blue, under his own pseudonym Jacques, and so begins the great love story. The movie follows Simon as he struggles with voicing himself to the world while wanting to protect the relationship he has with Blue. Love, Simon is beautifully authentic. It isn’t cheesy or predictable or unrealistic; it’s honest. It speaks to the fear that goes hand in hand with coming out, the anxiety surrounding everyone knowing what’s always been your biggest secret, the constant worry about whether or not you can really be yourself without having everything change. It shows how truly wonderful it is to fall in love for the first time. This movie finally gives the LGBTQ+ community what we’ve been waiting for: validation and visibility. For most of my life, I thought my feelings were abnormal or wrong because they always seemed to be taboo in the world around me. I never saw queer couples in movies or on TV, let alone in real life. The genre ‘romantic comedy’ had proved to be exclusively reserved for straight couples, and it didn’t seem like queer people were ever meant to have a love story. I cried because I finally saw part of myself on screen, and I didn’t think I ever would. Love, Simon sets an important precedent. This movie says ‘yes, you can have your love story.’ Not only that, but we deserve to have our love stories. It doesn’t make us feel different anymore; some of us have been have been that awkward teenager in high school who just about dies when they meet the person who makes their palms sweat and heart race in the best way. Except this time, that person is the person we can actually see ourselves with. Love, Simon certainly opens the symbolic closet door. As a gay woman, I also hope future movies speak even more to my experience. There’s an unfortunate tendency for most films centered around queer women to be grossly sexualized. I’m not looking for a passionate, borderline pornographic, unrealistic love affair. I don’t want a story of a woman leaving her husband for a female lover in some sort of sexual awakening. I’m tired of those movies that are clearly made because some filmmaker decided two girls being together is ‘hot.’ Enough. All I want is to feel warmth in my chest while I watch two girls on screen who bring me back to the moment I first fell in love. I want to cry because I can understand and feel everything that scares them and everything that raises a doubt in their mind. I want a movie that can continue to change the way our world perceives the ways in which people find love, just like Love, Simon did. 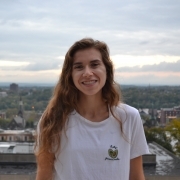 Susie is a student-athlete at Lehigh University and majoring in both English and Political Science. She’s hoping to pursue a career in writing and editing and eventually become a published novelist.